What is Monica Lewinsky doing now and when did she work at Bill Clinton’s White House? 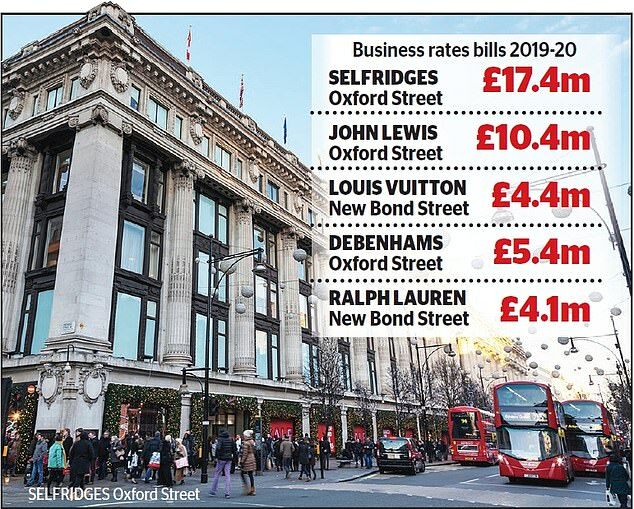 Selfridges will shell out £17.4million on business rates for its flagship shop in Oxford Street this year – almost triple what it paid in 2018. The upmarket department store is one of 8,000 properties in London’s West End braced for a £45million hike to their combined rates bill for 2019/20. Burberry’s store on New Bond Street will suffer one of the biggest increases, with its bill soaring from £935,770 to £2.6million, according to property consultant Altus Group. Meanwhile, the rates contribution for Debenhams’ Oxford Street shop will hit £5.4million – a 60 per cent rise on a year earlier. The department store group is scrambling with lenders to secure a lifeline and stave off collapse. Bosses have blamed rising costs, including business rates, for contributing to its troubles. The Mail has been campaigning for a major overhaul of business rates and a level playing field between traditional bricks and mortar retailers and online firms such as Amazon. Marks & Spencer, Debenhams and House of Fraser are all shutting shops in a battle to stay afloat.